Birmingham's biggest nightclub could have its licence suspended after police complained about stabbings, cannabis smoking and serious violence on Broad Street. Councillors meeting on Monday will be told of a string of problems linked to Gatecrasher, which has been dogged by rising crime levels. * A 4am brawl outside the club, which saw riot police deployed. 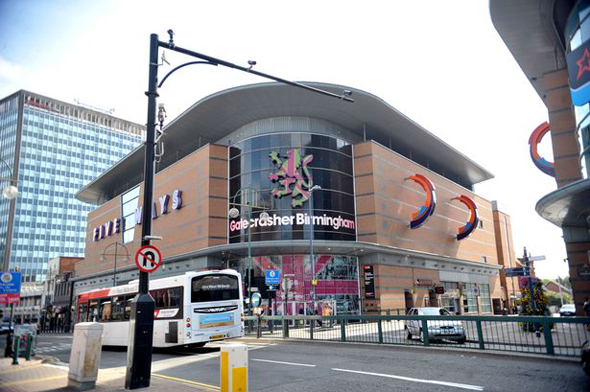 West Midlands Police asked Birmingham City Council to review Gatecrasher's licence last month. Members of an authority licensing committee will have several options available, including suspending the venue's licence for up to three months or revoking it. Supt Danny Long, who lodged the review bid on behalf of Birmingham West and Central Police, described the 2,400 capacity venue as a "serious concern" in his application to the council. Of the cannabis incident, he said: "On September 9, the premises were recorded as being closed, but officers attended and found 400 people in the premises. "Officers noted a strong smell of cannabis from the street and saw people openly smoking inside the venue." Police said the 4am brawl, which took place at the end of September, happened after officers dealt with two groups of men in the street. They had earlier been ejected from the club for fighting on the dance floor during an after-show party for a US rap artist, a report produced for Monday's meeting said. A Gatecrasher spokeswoman said the club was one of the safest in Britain but was working with West Midlands Police to put even more robust safety policies and procedures in place. She said knife arches were installed following the stabbings, along with state-of-the-art ID equipment. A street marshal scheme had also been launched and security staff were due to undergo advanced training with police, she added. Gatecrasher managing director Simon Raine said: "Safety and security has always been a top priority at Gatecrasher and remains so moving forward. "The safety of everyone who comes through our door is of the utmost importance and we continue to uphold the highest standards of safety. "We have invested a lot of time and money ensuring we get this right. "We continue to work with the police to underpin Gatecrasher as a safe and exciting entertainment destination. "We have a zero-tolerance policy on disruptive behaviour and continue to work closely with local authorities to prevent any anti-social conduct in and around the club." Six people have been arrested and bailed in connection with the mass brawl on Broad Street on September 29. It was revealed yesterday that a police investigation had also been launched after one of the arrested clubbers claimed he was assaulted by baton-wielding officers. Raymond Bradford, who travelled to Birmingham from his home in Liverpool for a night out on April 20, was sentenced to six years behind bars last month for stabbing the three clubbers. The court heard the 28-year old became aggressive and argumentative and repeatedly pushed into other clubbers before stabbing three strangers.